To connect an insane dot on this issue, a couple of months back when I along with my co-workers decided to have lunch in SM Mall of Asia we passed by the SM Arena that is presently being built adjacent to SM-MOA. Dominic (the Operations Manager in the company I’m working for) told me that the arena being built is due to finish early next year and there is a rumor that Madonna is to usher in its grand launch by being the first person to perform in the high-tech structure. I actually dismissed what Dominic said informing him that I (being a Madonna fan) have yet to hear or read about Madonna planning to have another world tour. 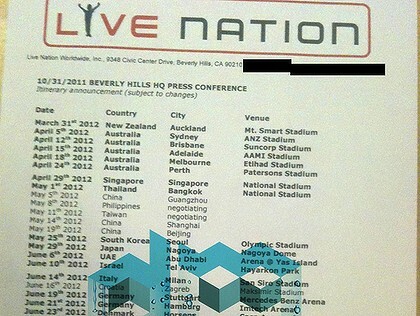 To further connect another freaking dot on this issue, a couple of weeks back my college classmate Karen Batangan posted on my Facebook wall that Madonna is due to hold a concert here in Manila. When I tried to verify this information, this came from socialite Tim Yap’s tweet. However, I dismissed this information after knowing that it came from Tim Yap since Tim Yap is not the type of person to be taken seriously. And to still further connect another bizarre dot in this ever rising rumor or fact is that in recent days, I was able to catch a TV interview of Marvin Agustin who plans and dreams to bring a Madonna-concert here in the Philippines via his Futurement, Inc., the concert-organizing company who produced the recently successful Bruno Mars concert here in Manila.